The Costa Brava is one of the most well-conserved regions in Spain since most of the fishing villages have retained their essence and many of the inland towns have kept their historical heritage intact as well as the fields (of flowers, wheat, apples…) all remain part of the landscape of this beautiful region. However, undoubtedly the main attraction on Costa Brava has to be its beaches, so obviously if this is why you’re visiting the region it is recommended that you stay in one of the many Costa Brava Apartments by the beach. You will find that there are also many villas Costa Brava has to offer too. If possible, you should stay by one of the following beaches, all of which have earned the prestigious Blue Flag quality mark. Gran de Portbou Beach: This small shingle and gravel beach is located in Portbou and you will find that it’s very calm throughout the year. It is only 30 meters wide, the water is very clear, and there are showers and toilets available if you need them. Because Portbou is located in a valley, it has not bee highly developed on and the village is still surrounded by nature which is why it deserves to be included in this list, for the sheer beauty and tranquility of the surrounding area. Tamariu Beach: This beach is difficult to access and is between Llafranc and Calella de Palafrugell, but it has a great natural beauty and water that is incredibly clean and clear. This beach is a sand beach and have sites for diving as well as disabled access and chair with beach umbrella rental. You will find el Paseo Maritimo nearby, which is a promenade with bars and restaurants where you can eat. This beach is easiest to access if you have a car. Canadell Beach: This particular beach is located in Calella de Palafrugell and in high season (around August especially) it gets very full indeed. This is the main beach of this charming old fishing village and it’s nice because you can watch the boats pass by as you’re stretched out on the beach. There are toilets, bins, and it’s easy to park nearby. There is also a small jetty on this sand beach. You will also find that Calella is one of the prettiest towns in the region that you shouldn’t miss out on visiting. 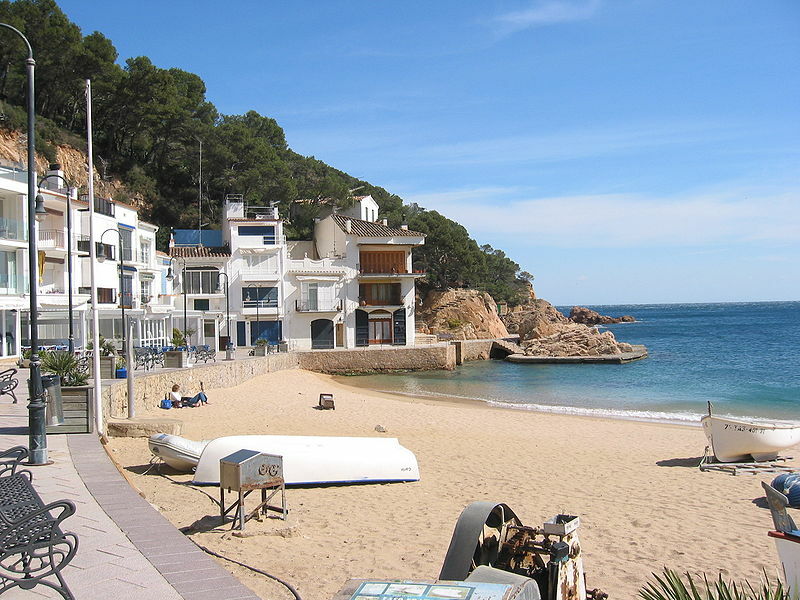 La Fosca Beach: Situated in Palamos with its golden sand, this beach also has areas especially for diving. There are many amenities here, which include a lifeguard service, showers, toilets, a yacht club, water sport facilities, and beach umbrella and hammock rental. There are also many bars and beach bars around for a little drink. Palamos is a busy town in summer but it has many leisure activities to offer. Mar Menuda Beach: At only 10 minutes from the historic center of Tossa de Mar, this beautiful beach is surrounded by beautiful rocks yet is a sand beach. The amenities on offer here include chair and beach umbrella rental, showers, and toilets. In addition, this beach has disabled access and there are several local restaurants and bars in the vicinity. There is also equipment for water activities and parking available. Remember that Tossa de Mar is a pretty town within wonderful medieval walls and it should be in your itinerary when you visit the Costa Brava. Whether you like rocky relaxing beaches, or touristy sand beaches with loads of amenities; make sure the next time you visit Spain that you don’t miss out on some of the best beaches in the country. So, now do you feel like visiting the Costa Brava?